For convenience and ease, make your next chicken salad with rotisserie chicken from the market. No need to season or roast it, because the store does it for you. 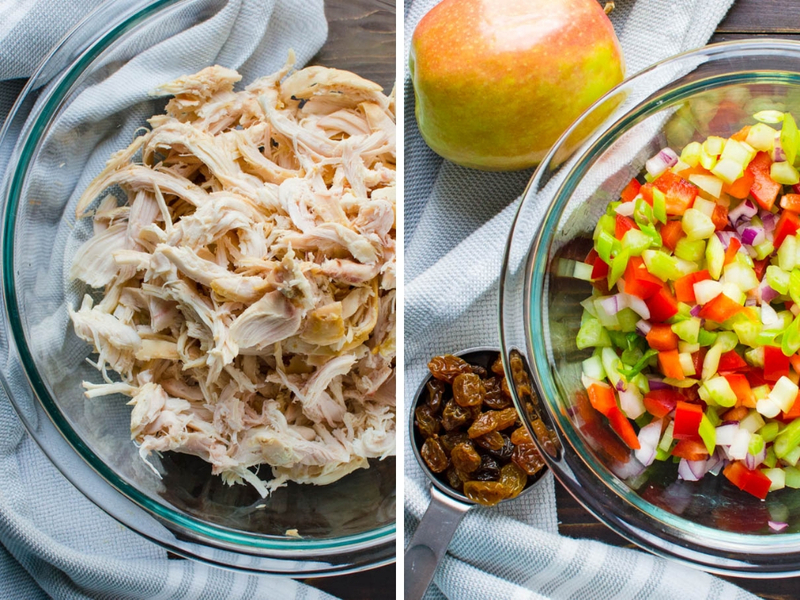 This rotisserie chicken salad recipe is not your average one either. 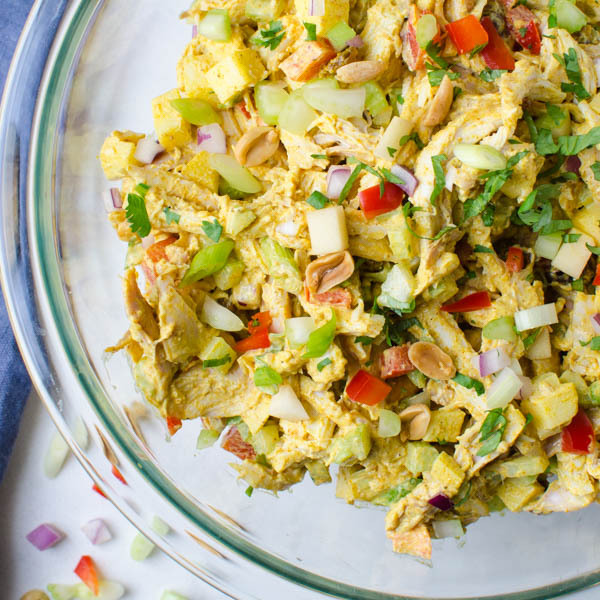 It’s a curry chicken salad with apples, raisins and crunchy peanuts tossed in a creamy curry, turmeric dressing that’s lightened up with greek yogurt. Chicken salad seems like a very old-school dish to me. I remember my grandmother, Myne, slow roasting chicken breasts for hers. Because of that step, it took a little time, but the convenience of a ready-cooked rotisserie chicken, makes this classic dish an “anytime” food. I like that. 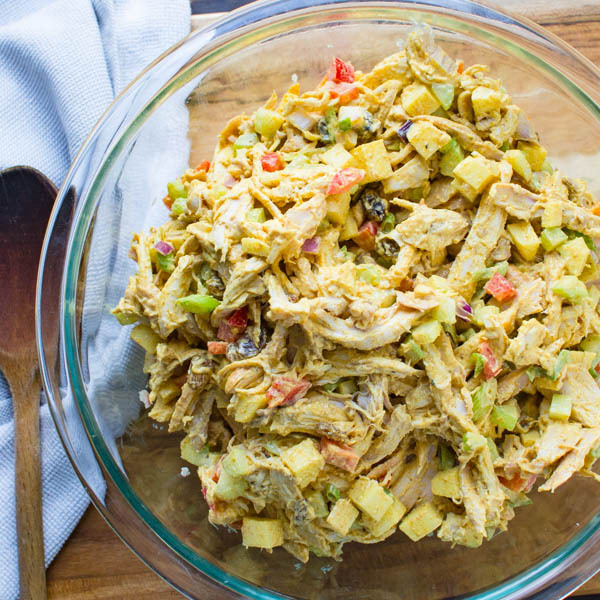 This curried chicken salad with rotisserie chicken has its roots in the classic preparation. It’s simple but with a few twists. A good chicken salad should have finely diced onions and celery, not big chunks, but a small enough cut that all you notice is a little flavor and crunch. 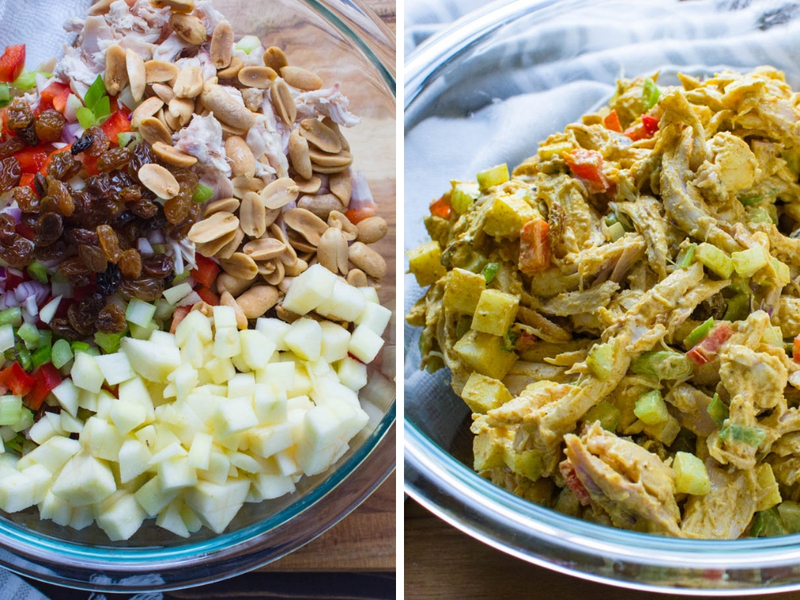 Diced apple and red bell pepper (cut the same size as the celery and onion) and golden raisins add sweet little nuggets that make this curried chicken salad infinitely more interesting. Remove the breasts from the cooked chicken. Discard the skin and pull the meat from the bones. Pull the chicken breast meat apart into shreds with your clean hands and transfer to a bowl. 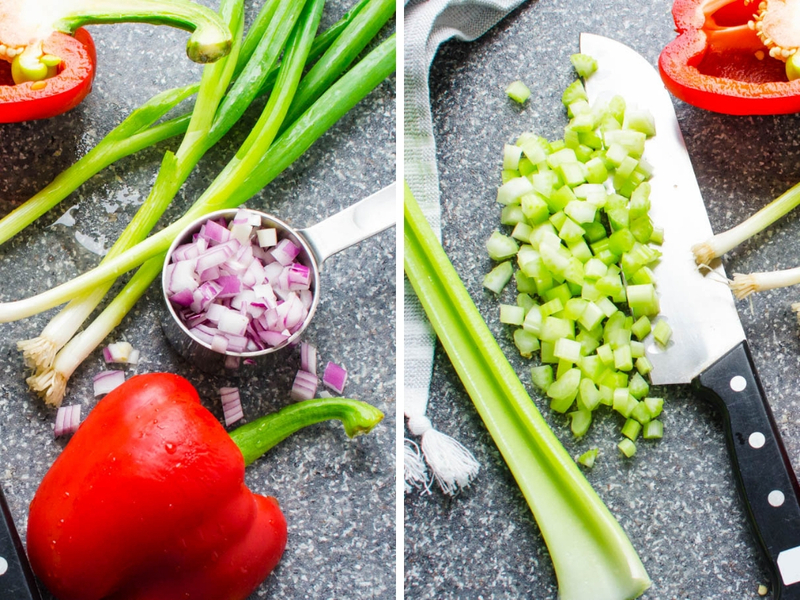 Chop the celery, onions, bell pepper and scallions into small dice (about the same size for all). Transfer to the bowl with the chicken. Peel and chop the apple to the same size dice as the vegetables. 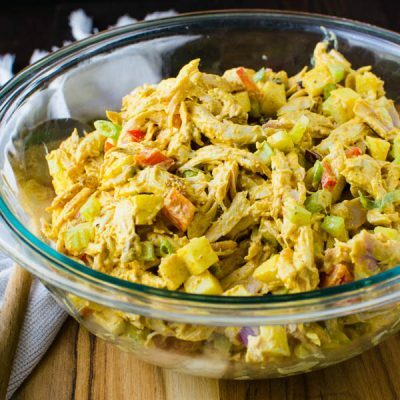 The dressing is 3 parts yogurt to 1 part mayonnaise and gives the curried rotisserie chicken salad a creamy, luscious binder to the meat and vegetables. The key to the curry dressing is not to over-do it. I usually add about half of the dressing to toss with the chicken salad. 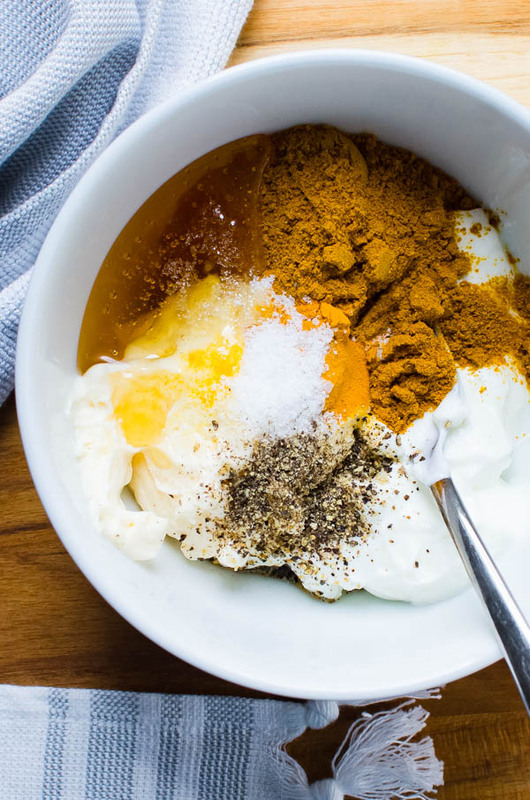 If it still needs more, add it a spoonful at a time. You want the salad to be coated, but not goopy or wet. You might also enjoy a little extra crunch in the form of nuts. I used salted and roasted peanuts, but to be honest, you can use any type of nuts you have on hand. It would be delicious with chopped cashews or almonds. Anyway, this curried chicken salad with rotisserie chicken is ready in about 25 minutes (less if you’re a fast chopper!) and it keeps for several days in the fridge, so brown-bagging at 7:30 a.m. just got a whole lot easier. If you are planning on making this for weekday lunches — I’d advise not adding the nuts until the morning you’re packing the lunch. That way the nuts remain crunchy. 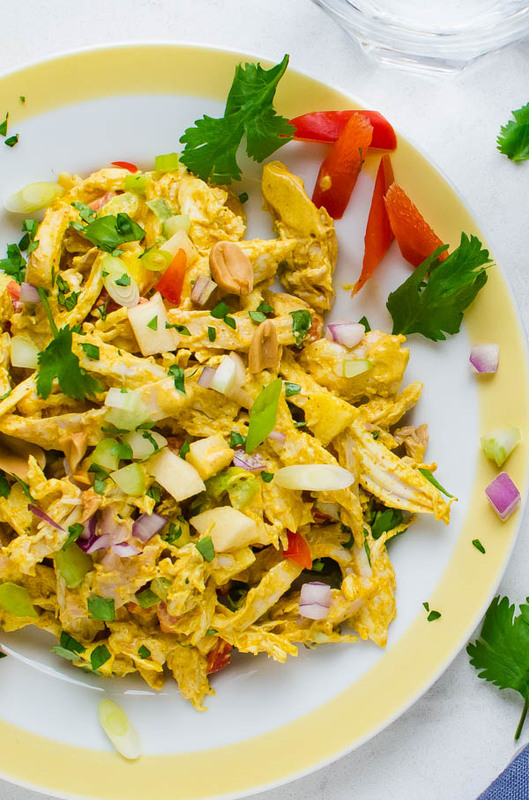 Shredded rotisserie chicken, apples, golden raisins and crunchy peanuts are tossed in a creamy (but lightened up) curry dressing. In a small bowl combine all the ingredients for the dressing and stir until well combined. Set aside. In a large bowl, combine the ingredients for the salad and and toss to combine. Add about half of the dressing mixture and fold it into the salad. Add more dressing as needed. It should be moist, but not soupy. Refrigerate until ready to serve. Great on sandwiches, tucked into a pita pocket or a bed of lettuce. 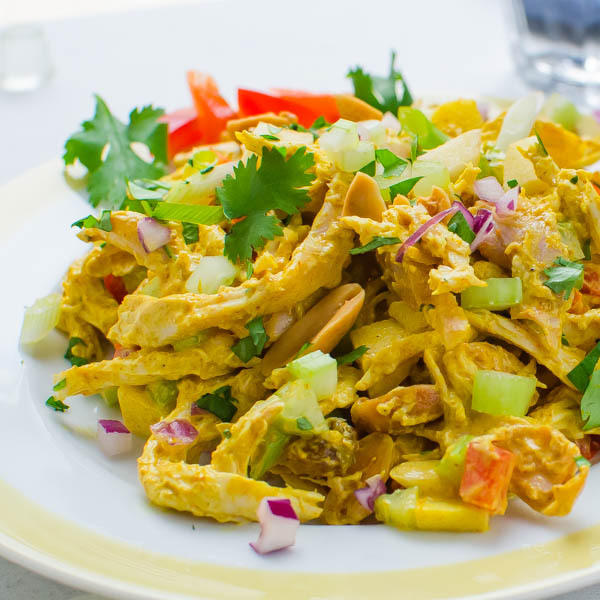 Pin “Curried Chicken Salad with Rotisserie Chicken” For Later! Now that summer grilling season is here, salads will be a staple for the next several months. This looks delicious. Curry and chicken are such a great flavour profile. Perfect to take on picnics too. My husband is literally addicted to rotisserie chicken, we buy one every week, so I’m thrilled to have this recipe to shake things up a bit! My husband is the same way, Sue! Let me know how he likes this! You’re welcome for the nonfat greek yogurt! We’ve all got to watch it during the summer, right? Thank you, Silvia – tastes even better! 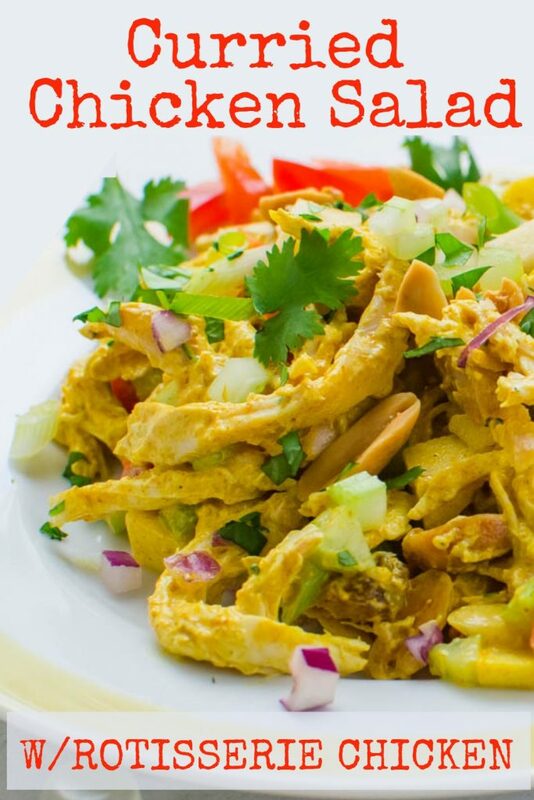 Chicken salad is a classic and I love the addition of curry flavor. I also love how quick this recipe is, looks delicious.